If you have kids, chances are you're familiar with PAW Patrol - if not, the short story is that it's an insanely popular animated series for children. Timothy Muirhead (of The Tonebenders fame) was the Sound Supervisor as well as the lead editor on sound effects for PAW Patrol: Mighty Pups, the straight-to-DVD project that is one of the best selling children’s releases of the year. Written by Timothy Muirhead, images courtesy of Viacom International Inc.
How did you get involved in sound for animation? When I was a child I wanted to be a music producer more than anything. I played drums and found my favourite part of being in garage bands was helping to arrange the songs that others would bring to the table. Then late in high school I took a media studies course and really loved it, that class might have been the only one I ever enjoyed to that point. So I changed my focus and aimed at going to film school to become a world-famous director. Once I was in college I learned that filmmaking involved a lot of sound work and I was immediately hooked. I ended up doing the sound edit and mix on just about every film my class produced. After 6 years working full time at a couple post-production studios I went freelance and concentrated my efforts on doing sound effects editorial for animation. It took a few years of living in crappy basement apartments and eating noodles for most meals, but then things really started to take off for me. I have been doing sound for animated series and films almost exclusively since 2004. I have now cut sound for nearly 600 episodes of various animated series. These have run the gamut from really edgy series aimed at adults to others like PAW Patrol that cater to the pre-school crowd. The shows for the little kids are always a lot of fun because you can get really weird with the sounds and the viewers love it. PAW Patrol has millions of viewers for every episode and kids watch these things over and over and over (spoken from a parent’s point of view). I know people who look down on working on children and pre-school projects. The idea of not being allowed to be dark and edgy turns them off. But those restrictions can actually force a lot of creativity. There are challenges in this genre that don’t exist in horror movies for example, and obviously the reverse is true as well. I have worked on super interesting documentaries and loved the way their soundtrack turned out. The sad part is not a lot of people ever see those projects. PAW Patrol has millions of viewers for every episode and kids watch these things over and over and over (spoken from a parent’s point of view). Kids around the globe love PAW Patrol. No other project I have worked on gets nearly the same amount of eyeballs. Timothy Muirhead in his edit suite in Toronto. How has working on a long-form version of PAW Patrol differed from your process on the regular episodes of the series? We have been really lucky to have essentially the same crew on PAW Patrol from season 1 thru 5 (and continuing into season 6 starting post in early 2019). I have been on the show since the pilot, as have our composers at Voodoo Highway Music (Brian Pickett and his crew), and our re-recording mixer Richard Spence-Thomas. We settled into the rest of our crew about halfway through season one when we brought in freelancers to help us out. We have a pretty big team now with Kyle Peters doing the music editorial, Ryan Ongaro cutting dialog, Patton Rodrigues recording all the actors, and assistant editors Mitch Conners (BGs) and Luke Dante (Feet). These are all busy pros working on multiple projects concurrently. I am essentially the only person on the sound crew doing PAW Patrol full time, as I am cutting all the hard effects and sound design, in addition to the role of supervising the audio post work. We were going to have to take on this new project while continuing to push out the work of multiple individual episodes of the series. So when we heard about the special coming down the pipe my first concern was if the crew could make time to fit in an additional large project. Then we realized that the Mighty Pups production schedule was happening over top of the Season 5 schedule we were already committed to. So we were going to have to take on this new project while continuing to push out the work of multiple individual episodes of the series. There was some sleep lost on how we were going to make this work. In addition to the overlapping workloads we quickly realized the Mighty Pups was a much more complicated version of PAW Patrol than the series had ever tackled before. There were big sequences that were going to need a lot of audio attention. Luckily our entire existing crew was able to find the days to cover the special…except for me. I was not going to be able to cut all the SFX for 4 episodes and the Mighty Pups feature in the time allotted. So we had to bring in an additional editor. I will be honest, this terrified me. All of the sonic world for 130+ episodes of PAW Patrol was stored in my head, how would someone else be able to step in and follow our “sound” without any lead-in time and in the middle of a crunch? It turns out it’s all in who you hire. We got super lucky bringing in Kristi McIntyre. She jumped into the project and immediately eased all my fears. Once we got rolling we were able to split up the various sequences and tasks with minimal speed bumps. 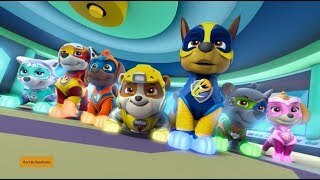 Part of the plot of Mighty Pups is that each member of the PAW Patrol mysteriously gains a superpower. Kristi and I split the work down the middle with each of us tackling the sound design for the superpowers of 3 dogs. 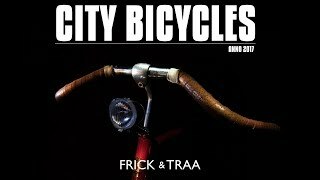 I handled all the vehicles, legacy sounds carrying over from the series and hard effects. Kristi took on the task of cutting the giant robot that takes over the city in the last two acts. It was so great to see/hear how Kristi approached these scenes. It allowed me to get out of my personal bubble on the show. She did lots of things differently than I would have. At first I was worried about her material not feeling “right”, but once I let go and realized she was breathing fresh life into the show, it actually changed my approach to the scenes I was cutting. I had to step up my game and bring a new perspective and energy to match the great stuff Kristi was delivering. On a good team, everyone’s contribution lifts up everyone else’s and details you were not expecting begin to reveal themselves. Suddenly you have a movie and not just a series of clips and scenes. It’s really magic. I always love the moments when you merge sessions from different departments or editors and hear everything together for the first time. On a good team, everyone’s contribution lifts up everyone else’s and details you were not expecting begin to reveal themselves. Suddenly you have a movie and not just a series of clips and scenes. It’s really magic. How was the mix approached differently? Richard was able to take our various water sounds and pan them along with the visuals so these sounds crash right into and beyond the viewer to the back of the room. The first and most important thing that was different was the time we had to work on the mix stage. We were lucky enough to have a much longer mix phase than we are afforded on the series. That makes such a huge difference. It allows for so much more detail to come through. In a few countries, including Australia, Mighty Pups had a theatrical release and I really wish more of the fans got to see it in that environment. Our mixing engineer, Richard Spence-Thomas, really did some cool things with the surrounds to bring the viewer right into the film. I worry that a lot of these moments don’t capture the kids’ attention the same way when viewed on an iPad. There is a scene where one of the pups, Zuma, uses his new powers to conjure up a tidal wave. On screen we see this huge wave break and then washes right through the camera position. Richard was able to take our various water sounds and pan them along with the visuals so these sounds crash right into and beyond the viewer to the back of the room. The scene really works perfectly and makes it a really fun moment in the film. Also because of the way the schedule fell, we had to mix reels 1-3 and then take a two-week break before we came back for the final two reels. This meant that the SFX for the back half of the film were still being cut as the front half was mixing. This made for a bit of a data wrangling issue as everything was delivering in various states of completion. I had to really stay on top of things to make sure everything got to the stage properly and in time for the various mix passes. As much as I thought the SFX benefited from the extra time mixing it was really the music that gained the most. We are lucky to have great composers from Voodoo Highway and our music editor Kyle Peters. Between what they brought in their tracks and the time Richard had to carve the cues into the mix, I think the score really exploded off the screen. There were a couple times during various playbacks that I was really taken in by the emotions the score managed to evoke, especially the triumphs. Did you approach this project differently because the viewers of Mighty Pups are so young? We were really attentive to the line between making it big and adventurous and it becoming too dangerous and scary. I am lucky to have a 4-year-old son that fits right in the pocket for the target audience of PAW Patrol. So I was able to use him as a kind of test screener as we worked on some of the Sound Design. I definitely changed my edit on a few occasions after he had a bad reaction watching early passes. Mighty Pups has a lot more action sequences than a normal episode of PAW Patrol. We were really attentive to the line between making it big and adventurous and it becoming too dangerous and scary. There is a sequence where a fiery meteor comes down from outer space and then crashes into the town the pups live in. In early passes we cut this impact as a big explosion and rocky impact, which is what you see on screen. But it just ended up being too scary for the little ones. So we went back and replaced a lot of the impact with synths and brighter more magical sounds and this made a huge difference in the danger felt by the viewers. There was a similar approach with the giant robot. We had to find a balance between cute and menacing. More servos and clicks then heavy metal movements and impacts. I belong to a Slack group of field and SFX recordists and another member, Kai Paquin, had posted pictures where he recorded a remote control car they mic’ed up with onboard microphones the way you would with a real, full-size car. I loved that idea. So I got a bunch of my son’s remote controlled toys and wired them up with my DPA 4060s and then put them through their paces. These recordings became the basis of the robot prison guard character in Mighty Pups. They gave me the servo/robotic sounds I needed but were also familiar to a child viewer’s world. Not only are the fans of PAW Patrol children but so are many of the actors that do the voices on the show. I have worked on a lot of animated series where the children characters are voiced using adults that sound like kids. This is great because the adults are professional actors with lots of experience. PAW Patrol made a decision right from the start to use real children as the actors behind the pups and all the child characters in the show. Our recording engineer, Patton Rodrigues, is a genius at keeping the kids focused and the sessions fun. He is obviously a fantastic engineer, but it is his skill at interacting with the kids that keeps them engaged. He has perfected the high wire act of being their friend and focusing them in order to get all the lines needed completeted. But sometimes even Patton can’t get the perfect line from the kids. Then the dialog editors, Ryan Ongaro and sometimes Patton himself, work some real magic and put it together in the editing room. Compared to other animated projects the dialog edit on PAW Patrol is way more intensive and the job they have done is flawless. What is going to stick with you most from the Mighty Pups Experience? Creatively it was really great to step out of the regular series and have the time to really stretch out the possibilities of sound within the sonic world of PAW Patrol. I am really proud of everyone who worked on this project and how it turned out for the viewers and fans of show. A big thanks to Timothy Muirhead for giving us a look at the animated sound of PAW Patrol: Mighty Pups! Timothy Muirhead is a Sound Supervisor and Editor working out of Toronto in Canada. He is also one of the founders and co-hosts of the long-running Tonebenders Sound Design Podcast. Learn more about the excellent Tonebenders podcast here.